by Andy Higgs in Features, Home, Places, Stay, USA. Moving on from St Augustine wasn’t easy – we really enjoyed both the town and our stay at the St. George Inn. But having discovered a side of Florida that was so different from Miami and Orlando, we were excited to see what our next destination offered. Opened 2000, renovated 2009. 122 rooms over 4 floors. 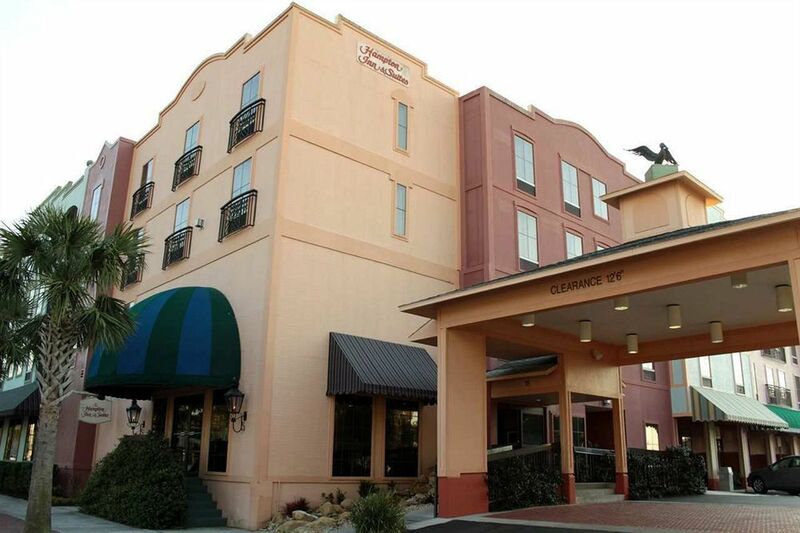 The Hampton Inn & Suites is located on the harbour front and in the centre of Fernandina Beach, the only town on Amelia Island. With a wide variety of restaurants and shops within walking distance and the Atlantic beaches just a few minutes drive away, the hotel is ideal for first-time visitors to the island. One thing to note is that the train runs behind the hotel (between the building and the water) and does come through at night now and again. Ask for a room at the front if you think this might be a problem. There is free onsite parking for hotel guests – if you can get a spot. The car park is fairly small given the number of rooms and the fact that just about every one of their occupants will be driving. But fear not – you can leave your car on the street for free a few blocks away out of the centre of town. As was the case with all of our hotel bookings on this trip, the priorities were: location, pool, value. 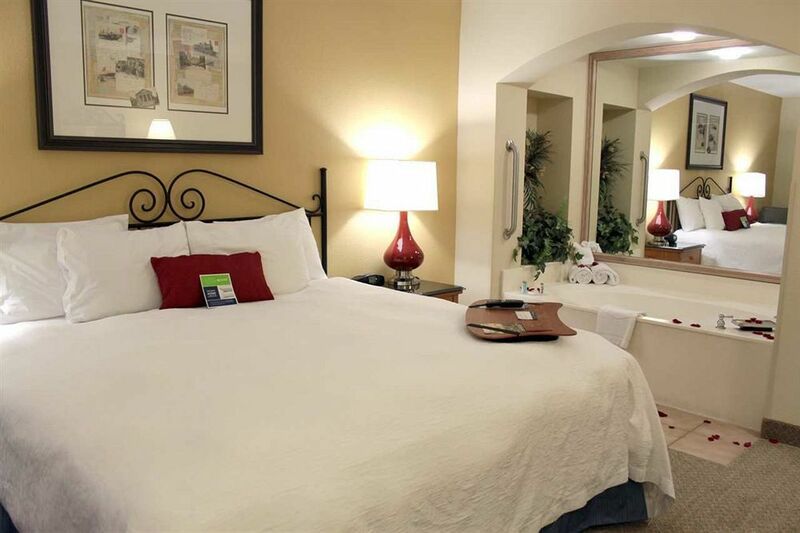 The Hampton Inn & Suites has a superb location, a swimming pool and is also very good value – especially for families. In other words, it was an easy choice. Given that we were arriving on the Fourth of July, we wanted to be close to town to see how the Americans celebrate Independence Day – a new experience for all of us. The Hampton Inn & Suites has a number of different rooms – and suites. There are standard doubles with king-sized beds, twin rooms with two queen-sized beds and deluxe rooms with whirlpool baths. If you need more space there are suites with separate living rooms and kitchens available in various configurations with or without whirlpool baths or you can go the whole hog and book the presidential suite. For our stay we booked two King Deluxes with in-room whirlpool baths. I particularly liked the design of the rooms here. As an early riser – I love to get out and take photos before breakfast – I appreciate the ability to do so without waking up my wife. With the bathroom right by the entrance door and the in-room bath creating even more distance to the bed, our room was perfect in this regard. By leaving my clothes ready and my camera bag packed I was able to slip out and enjoy the town as the sun came up. Yup. But clean and in good condition, so no complaints there. The bathrooms were compact but well-designed, contained a large shower unit with excellent water pressure and all the usual amenities. Yes, the hotel has free and fast Wi-Fi throughout the property. The hotel does not have a bar or restaurant, but there are dozens within walking distance. 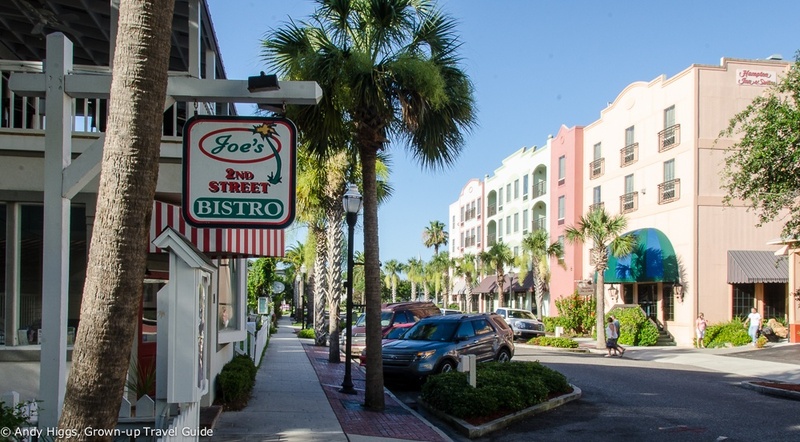 The old town has a number of well-regarded places to eat – including our favourite, Joe’s 2nd Street Bistro which is across the street. Yes and no. There is an outdoor pool, which is a great way to cool down. It’s not huge, but it was highly rated by the expert in our group (Rebecca). No sauna, but there is a fitness room – which we actually used for once. It was highly rated by the expert in our group (Mari Anne). Extra points for having plenty of towels available at both facilities as well as water dispensers. A pool bar would have been good, but you can bring your own refreshments. Yes, brekkie was part of the deal. 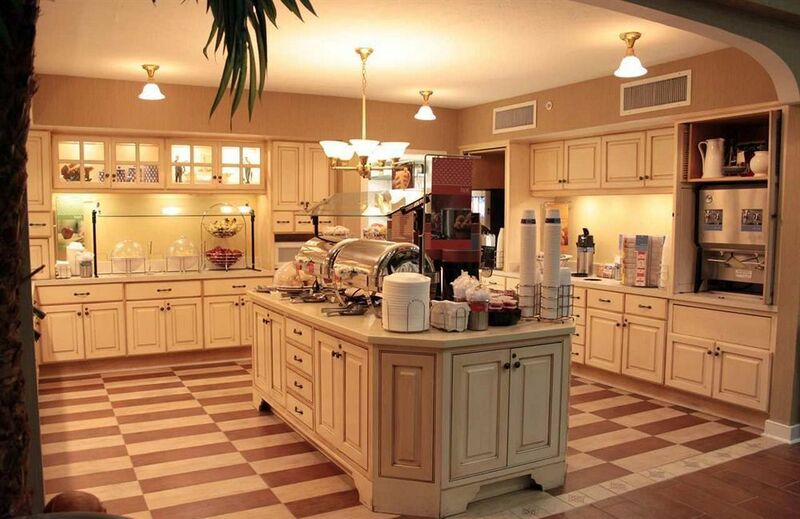 A buffet service consisting of a limited but adequate range of hot and cold food and great coffee. Rather limited seating which resulted in some guests taking their breakfast to the pool or back to their rooms. Excellent service from arrival to departure. Staff were cheerful and friendly at all times, whether at reception or passing by in the corridors. Yes, Hampton Inn & Suites is part of the Hilton chain so you earn HHonors (sic) points for your stay. Naturally you can join here at reception or online and naturally you should. Yes, they can take care of your luggage if necessary. We paid USD 169 for each room but since we stayed over the 4th of July holiday weekend this was a little higher than usual. The 2014 rates for advance purchase start at under USD 150 – an excellent deal. This being Florida, you’ll be charged an additional 10% in state and county taxes. Big, well-designed rooms. Very comfortable beds. In-room whirlpool bath. 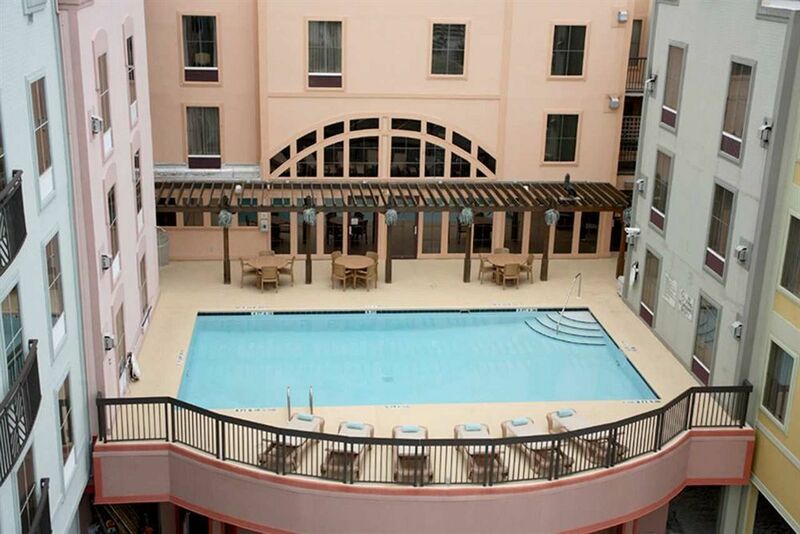 Great pool, excellent service, unbeatable location for the old town. Free parking. Free WiFi. The only thing I missed was a pool bar. 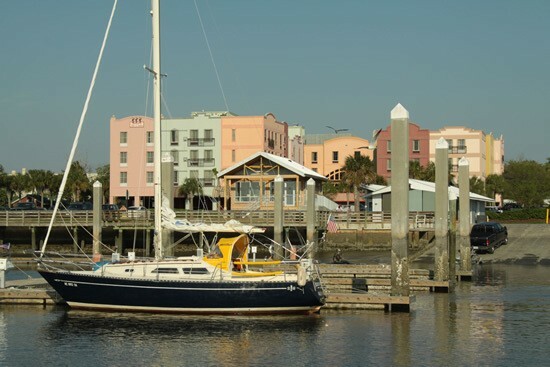 For Amelia Island – and more specifically for the lovely town of Fernandina Beach – look no further. This was our first stay at a Hampton Inn & Suites and we were thoroughly impressed – this hotel is highly recommended and one of the best on our Florida road trip. We will be back! Please note: The author travelled as a regular tourist – no mention was made of the fact that a review would be written, the establishment was not informed of the author’s intentions and no special discounts were enjoyed. ← Shopping on a budget? Lovely, clean hotel. 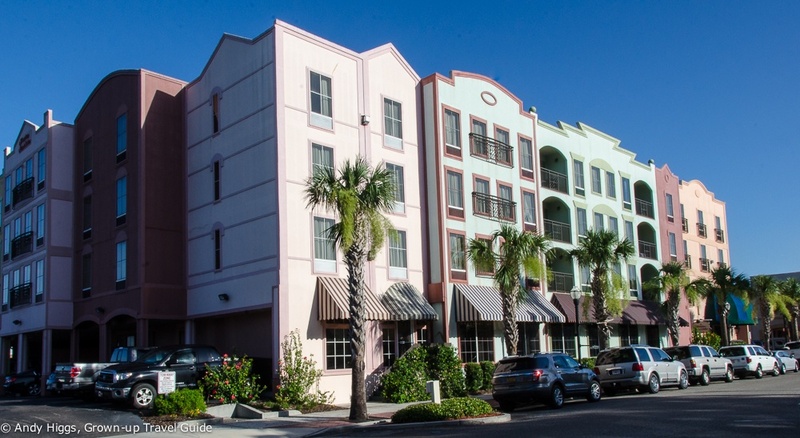 Fabulous location in town and on the marina. Close to nice restaurants, shops and attractions. Very, very clean. Good breakfast in the morning and friendly staff. 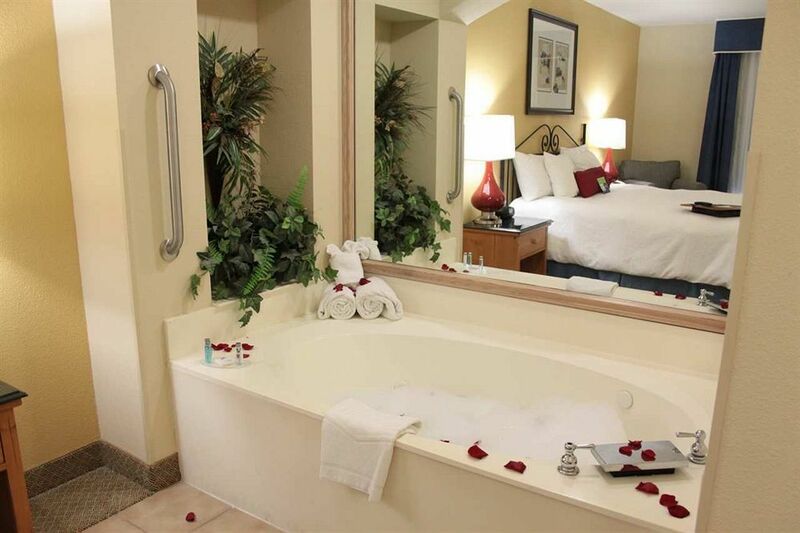 Comfortable bed, nice jacuzzi tub in room. Really nothing negative to say about this hotel. Easy drive to the beach. Enjoyed the stay immensely.